Festival Report - Rama Navami 2016 ~ The Toronto Hare Krishna Temple! 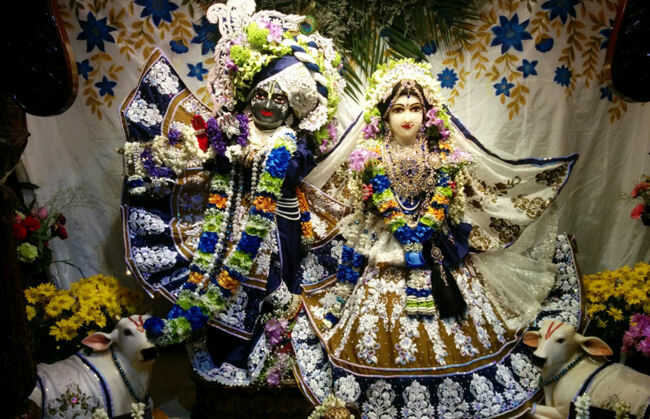 On Friday, April 15th, devotees gathered at Toronto's Hare Krishna Temple to celebrate the appearance of Lord Ramachandra. Lord Ramachandra is Krishna's avatar who ruled the earth as the ideal king. He appeared more than two million years ago. The history of Lord Ramachandra's pastimes is recounted by the sage Valmiki in his epic Ramayana. The festival began with wonderful kirtan and while the crowd was small, it quickly grew as devotees arrived for the festivities. A very nice class was given by Mahabhagavat das as he read from the Ninth Canto of the Srimad Bhagavatam. His class helped to paint a wonderful picture of the glories of Lord Rama. Following the class, a unique interactive feature was in store for all the assembled devotees. With the Temple Room now filled, a special "Lord Rama Game Show" was held! With some fun background music, questions about the pastimes of Lord Rama were put out to the crowd and devotees fell over themselves as they raised their hands to give answers. The prize for a correct answer? A banana which was offered to our beautiful Deities! A delicious feast then awaited all the assembled devotees and the program finished with an enthusiastic kirtan. The evening provided a great opportunity for all the devotees to come together and celebrate the glories of Lord Rama!